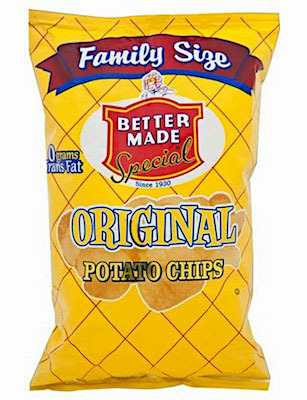 According to the FDA, Better Made Snack Foods has recalled certain batch/lots of Original Potato Chips from the US marketplace because they may contain undeclared Milk, a known allergen. If you have an allergy or severe sensitivity to Milk run the risk of serious or life-threatening allergic reactions including Anaphylaxis if you consume these products. The recall was initiated after it was discovered that a package of 10-ounce Original Potato Chips sold with a date code of 10 AUG 2019 did not contain Original Potato Chips but instead contained Cheddar and Sour Cream Potato Chips, a product that contains Milk. Subsequent investigation indicates the problem was caused by a temporary breakdown in the company’s production and packaging processes that may have affected 660 bags of the Original Potato Chips. If you believe you have purchased or have in your possession any of these recalled Potato Chip products and could be allergic to their Milk ingredients, have a close family member who is allergic or has previously experienced Anaphylaxis or are unsure of your allergy status, please do not consume them directly nor use them as an ingredient in another dish or preparation. Instead, return the product to the store where you purchased it for a full refund. If you have any questions about this recall, please contact Better Made Snack Foods at 1-313-925-4774 from 8:00 AM to 4:40 PM, Monday to Friday. ==> To see other recalls and notifications for products manufactured, marketed and/or sold by Better Made Snack Foods, please search for “Better Made” using the Search Box at the top of this page.